You are here: Home > What are the odds you are betting too much? What are the odds you are betting too much? Find this out and more at Gambling Harm Awareness Week (22 – 26 Oct). This year’s theme is online betting. 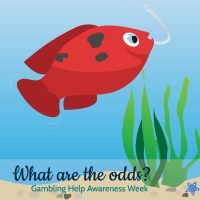 What’s on during Gambling Harm Awareness Week, 22 – 26 October? PEACE Multicultural Services serve up ‘The Big Fish’ in multiple languages on Friday 26 October from 3pm at Cypriot Hall, Welland. The Gambling Help Service at Relationships Australia SA is launching on Tuesday 23 October at 1 pm ‘Winning?’ – a short animation aimed at 18 to 25-year-old men about the potential dangers of online sports betting. Join us @RelationshipsAustraliaSA for the fun and interesting launch hosted by Will McDonald (9News presenter) and joined by Ryan Fitzgerald (Media personality & AFL “star”) and Dr. Daniel King (The University of Adelaide). Meanwhile, over at the PEACE Multicultural Services, once again, they are not doing anything by halves! They will be putting on an exciting event to launch ‘The Big Fish’ animation in ten different languages! ‘The Big Fish’ is a story about how online betting can entrap you and how to get free from it. The Assistant Minister to the Premier, the Hon. Jing Lee MLC will open the event. The SA Mental Health Commissioner, Chris Burns CSC will speak about the intersection between mental health and gambling. Three sides of the Coin will be performing. They are a theatre group from Melbourne. Their performance has a profound effect on audiences and getting the wider community to talk about gambling. The event will conclude by awarding certificates to all the ambassadors and volunteers who assisted with translating the video into the ten different languages. All are welcome to attend this event on Friday 26 October from 3 pm to 6 pm at Cypriot Hall, Welland. Keep up to date on our Facebook page or Events Calendar. These services are funded by Gambling Help Services is funded through the Gamblers Rehabilitation Fund, a joint initiative of the Australian Hotels Association (SA Branch), Clubs SA, Adelaide Casino and the Government of South Australia.